Far away, in a remote mountain village, there is a cobbler's shop. And in the window there sits a shoe. Not just any shoe, but a jewel-encrusted blue shoe. When the shoe's largest jewel goes missing, the cobbler's assistant, Hap, is blamed and banished to the dreaded Mount Xexnax. Legend has it that no one has ever returned from Xexnax, but Hap Barlow isn't just anyone, and legend is about to be rewritten. Perfect for middle graders, The Blue Shoe has the feel of a modern classic. You'll read the first page and grin, and then chortle, and then heave a happy sigh as you settle in for what will clearly be a great yarn. Told with a bit of a wink, this quirky gem is full of heart, and utterly winning. RODERICK TOWNLEY has taught in Chile on a Fulbright Fellowship, worked in New York as a journalist, and now writes from his home in Kansas. His books have received many stars and accolades, including BookSense 76 picks and BBYA selections. You can read more about Roderick Townley and his books at rodericktownley.com. MARY GRANDPRÉ is perhaps best known for creating the jackets and illustrations for the Harry Potter books. She has also illustrated many fine picture books including Jack Prelutsky's The Carnival of the Animals on Knopf's Fall 2010 list. You can read more about Mary GrandPré's work at MaryGrandPre.com. Not long ago, in the sunny mountain village of Aplanap, famous for its tilted streets, cuckoo clocks, and Finster cheese, there stood a small shoemaker’s shop. And in the window of that shop was a shoe that fit nobody. Of course, since it was only one shoe, it was doubly useless. Yet everyone who learned of this shoe was seized with the desire to own it. Curious travelers with hard money winking in their pockets came from as far away as Doubtful Bay. But the shoe was not for sale. You’re thinking this must have been a remarkable shoe. People lined up outside the shop just to look in the window. Even the town’s mayor (whose name is far too long and important to write out here) felt tempted by it. He was an impressive man, but not an easy man to impress. Passing in his carriage, he’d have the coachman slow down so he could catch another glimpse of the famous object, with its sapphires, opals, and moonstones flashing in the sun. Did I mention the shoe was covered with precious stones? Precious and semiprecious, and a few (like the beads of Murano glass) merely beautiful. And all of them blue. Blue of every description, from palest aquamarine to clearest azure to dramatic cobalt to assertive navy to deep-thinking indigo. The shoemaker--I should say this right away--was a simple man, nothing remarkable about him at all. Every-one called him Grel, which was his name, or as much of it as anyone bothered to remember. Grel was neither very short nor very tall. He wasn’t particularly thin, nor exactly fat. Neither ugly nor handsome. He had a beard (now threaded with gray), but most Aplanap men wore beards. He was poor, but not poor enough to be arrested. Did I mention that the poor were arrested in Aplanap? They were. Well, beggars were arrested. You could be poor all you wanted and you’d be left alone. But if hunger forced you into the streets to beg for a coin, large men would come and cart you to jail, and from there, they’d ship you to the north side of the next mountain, a peak so tall its top was perpetually covered in snow and surrounded by swirling clouds. There were many superstitions about this mountain. It stood in plain sight, and yet you couldn’t see the top of it. At night, it was even more mysterious, because the peak pulsed with a dull orange glow. No doubt the light came from the campfires of the beggars condemned to live there, but you know how people are. They’ll believe anything. Some said the mountain was really a volcano. Others claimed that trolls hopped about among the crags and spent the nights forging weapons over a great fire. Still others believed the ancient myth about Xexnax, the goddess the mountain was named for. The glow, they said, came from her kitchen, where she roasted the poor doomed souls who’d been sent there. Whatever the truth, you didn’t want to end up on that mountain. It was a good thing Grel had Hap Barlo, a young boy he’d taken in as an apprentice. A slim thirteen-year-old with nimble hands and likeable eyes, Hap was smart in ways that Grel was not--quick with numbers, sharp at business. More than once he’d saved his absentminded master from ruin. They were never far from ruin as it was. Cobblers were always needed but badly paid. Grel and the boy often lived on crusts, although they could usually indulge in a slice of schnitzel on Sundays, sitting at a little table in front of the shop, with Grel’s dog at their feet. The dog’s name was Rauf, since that was the only word the creature knew. Rauf sometimes spoke his word to the passing cats, but he lacked conviction, and the cats paid no attention. On summer evenings, Rauf would lie contentedly in the dust, one eye closed, the other watching his master and a few old friends playing a game of Plog after the day’s work was done. There was something reassuring in the clack of wooden pieces on the game board and the smell of pipe smoke spiraling over Grel’s head. As far as the rest of Aplanap was concerned, Grel might have been invisible. Even regular customers would have a hard time placing him had they seen him outside his shop, without his work apron, walking the tilted streets. Grel didn’t mind. He had no desire for recognition. He cared about his sleepy dog, his alert young apprentice, and his art. For he was an artist among cobblers. He might seem vague as he pottered about his shop or rummaged around looking for his glasses, but when it came to work, his concentration was unmatched. The idea of tearing the stones off the fabulous shoe and selling them would never occur to him, any more than he’d tear out his own eyes, especially since, long ago, with excruciating care, he had placed the jewels there himself. Grel often thought back to that rainy evening when a weirdly tall stranger, his face shadowed in a cowl, had slipped into the shop at closing time. 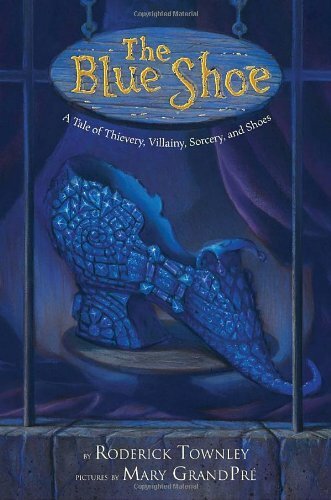 What struck the shoemaker at once were the man’s eyes, which glittered with a cold blue fire. Wherever they alighted, they lowered the temperature by ten degrees. “What can I do for you, sir?” Grel said. Grel did not understand at first. The man had a strange accent, a nasal tone, and a voice that started with a grumble in his throat. The stranger ignored him. He pulled out a sketch and laid it on the workbench, smoothing its creases with his skinny hand. One shoe. That’s what he wanted. And he paid in advance. Grel watched the heavy coins clink on the wood. “But that’s too much!” he faintly protested. More coins clinked on the wood. Grel shook his head. It was ten times what he generally received for his work. And only one shoe! What could be simpler?